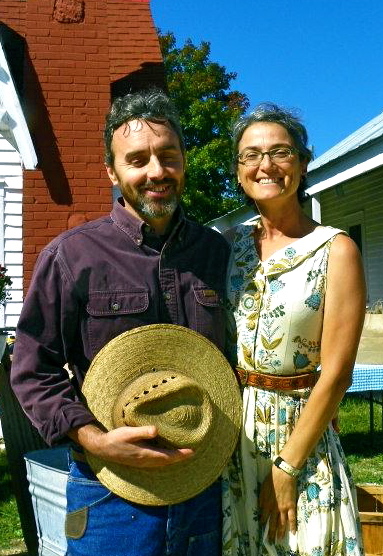 Stuart Farm, LLC was started by, Fred and Serena, in the spring of 2012 when they decided they wanted to provide a better quality of food to the community. They had been raising chicken for family and friends, and began branching out to neighbors. The first season they sold out, and have continued to do so every year. Yes, the chicken is just that great! The farm is on 7 acres next to the family’s 180 acre farm in Gerald, MO. This is the farm Fred grew up on and he and his sisters helped get back up and running through their childhood. His parents have long since given up on raising animals, and all the sisters have moved off the farm. Fred, however, had a dream. After moving away and working on a research ship in the Antarctic as an electronic technician, he moved back to the farm and started to plan how he was going to bring it back to life. He started with a small flock of layers and meat birds to produce enough for him and his family. Then he went in with his brother-in-law on a herd of Belted Galloway cattle, keeping 2 for himself and sharing a bull. While he was dreaming and planning, so was Serena. Thankfully, they had the exact same dreams–the biggest being finding someone to share the crazy life they both wanted to live. Six months after they met, she was moving on to the farm and plans and dreams started to take shape and become a reality. The laying flock was increased, as was the meat bird production. Two steer were purchased. Fred finally got his Christmas goose when they raised a flock of 6. 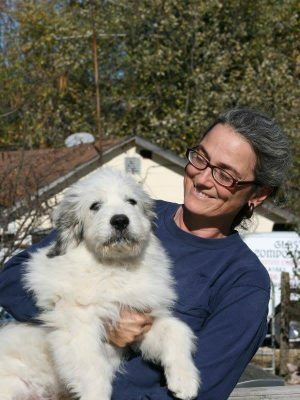 Maxie, the Great Pyrenees, was purchased to help protect the flocks and to alert any potential threats or escapes. A creamery was set up in anticipation of a milk cow. Since that first year, the farm has grown by leaps and bounds. A small herd of American Milking Devons was started. Serena has been trying to teach the calves oxen commands so they are easy to handle. Tamworth sows were purchased to start a pastured pork operation. Classes and consultation services were created to help others learn how to raise their own chickens without such a steep learning curve. On the farm, the goal is to provide a happy and natural environment for the animals. With lots of sunshine, room to roam, and a natural diet, there is no need to medicate “just in case” with antibiotics. Whether it’s the cows, chickens, or bees, making sure they are happy and have the life they were meant to have is priority. All of the animals are treated with respect, kindness, and love. Chore time is used to observe the health of the animals, ensure their safety, give out pets, scratches, and treats, and to be amused by their never-ending antics. Caring for the soil is just as important as caring for the animals. The farm is a mix of pastures, bottomlands, woods, and native grasslands and are managed with the soil’s and animal’s health in mind. We hope you enjoy our food and following along with us on this adventure that is living on a farm. Have a question, compliment, or complaint? Give us a call at 573-764-2324 or fill out the form below.